Suisun Valley AVA and Green Valley wine grape growers say their fruit is very different from the rest of Solano County and deserves a lot more respect — especially in prices paid for their grapes. 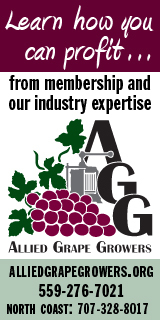 Allied Grape Growers (AGG) agrees and notes that those areas are almost entirely within the North Coast AVA and have soils, climate, and production characteristics that are radically different from the low-lying, super-productive Delta areas in eastern Solano County. A more detailed map looking at the Suisun Valley AVA/Green Valley topography and its North Coast relationship is available farther down in this article. In a packed presentation to Suisun AVA/Green Valley growers in Rockville, AGG Vice President Jeff Bitter said that their grapes have more common with Lake and Mendocino Counties as well as coastal crush Districts 7 and 8. Bitter noted that many Napa County wineries have started to source fruit from the area now that Napa has been planted to capacity. Caymus owner Chuck Wagner is one of the prominent Napa Valley vintners who has taken notice of the area’s similarity to Napa County. Wagner has placed a bet on the area with vineyards and a 5+ million gallon winery in Cordelia. 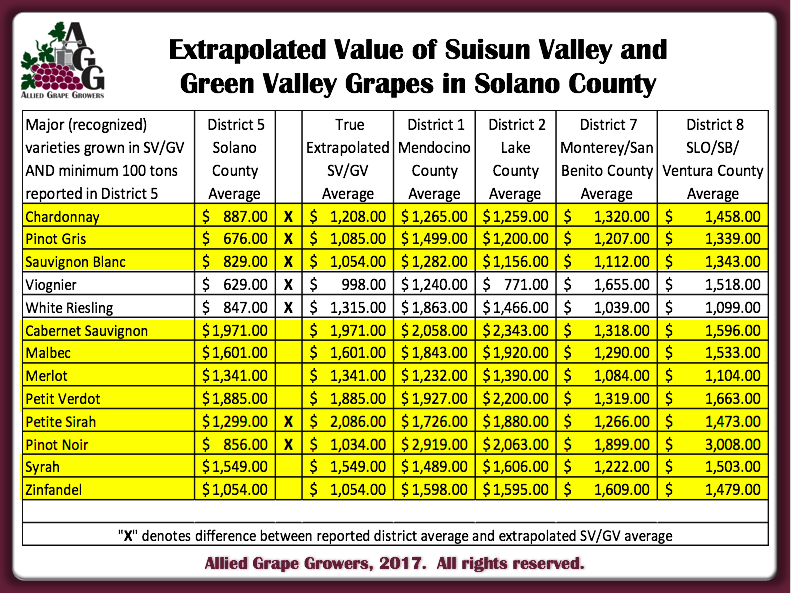 However, because all of the grapes in the entire county are grouped into Crush District 5) many of the Suisun AVA/Green Valley varietals are represented in the crush report (via the district average) as selling below their actual value. Bitter presented data (below) that represented an analysis of that price undervaluation. The county averages were taken directly from Table 8 of the 2016 Final Grape Crush Report. 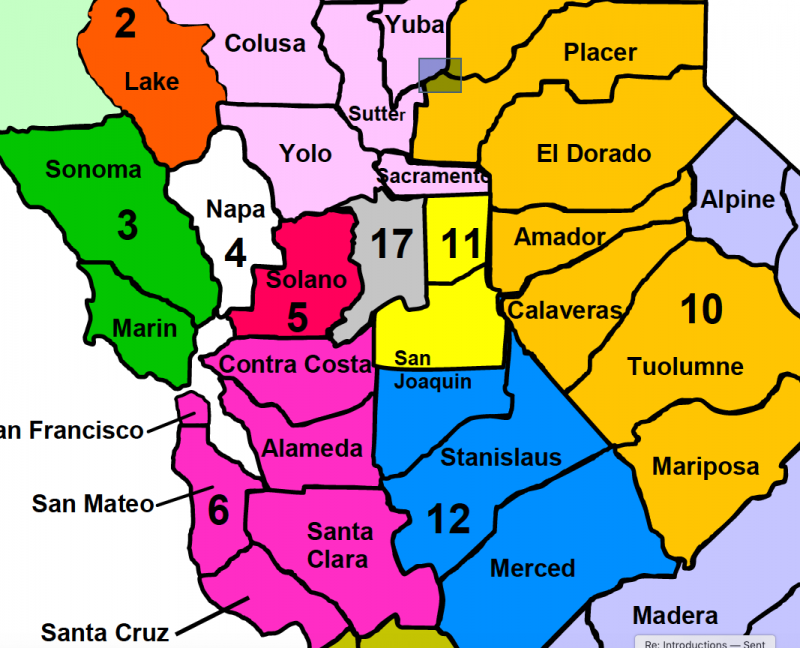 The “True Extrapolated SV/GV” column was the result of removing the influence of fruit purchased in areas of Solano County that do not include SV/GV. This was done via line-by-line analysis for all varieties in District 5, Table 8. Any purchase entry that was not SV/GV was removed and the new weighted average for each variety was computed. The removal of the non-SV/GV entries was based specifically on our market knowledge and insight regarding purchases in District 5 (since we have a considerable number of members there). However, it is mostly clear to even the “untrained” eye when looking at Table 8 that there are specific price chasms in the line entries for most varieties. In addition, these price chasms are generally accompanied by larger tonnages reported at the lower recorded price points (indicative of quantity purchases by large “interior” buyers in the Delta) and smaller tonnages reported alongside the higher price point entries (indicative of “coastal” buys – specifically those in SV/GV). Right-click map to view a larger image. A detailed look at the Suisun AVA/Green Valley area, above, shows that the two areas are almost entirely within the North Coast AVA. 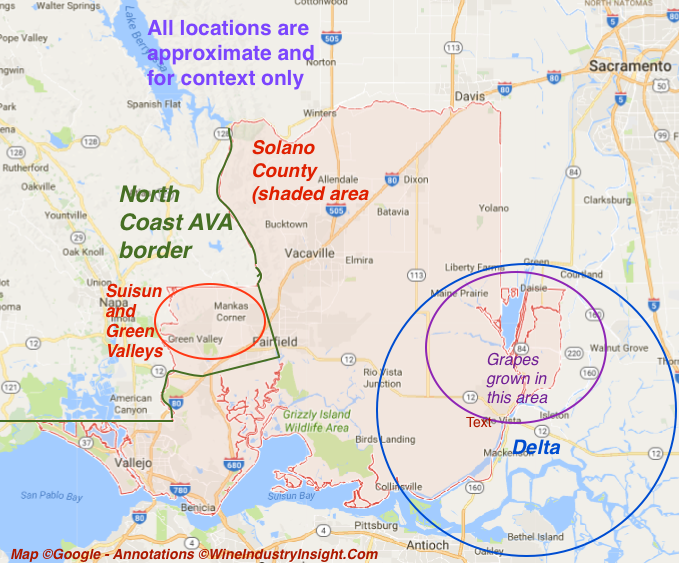 In addition, a topological comparison of the area with the southwest area of Napa County shows similar northwest ranging terrain with southeast exposure to winds coming off a large body of water and higher elevations in the Suisun/Green Valley area. No government or expert evaluations have been made yet of the total planted acreage in the Suisun/Green Valley areas. However, experts interviewed by Wine industry Insight estimate that the two areas have about 3,000 acres planted bearing and non-bearing combined. 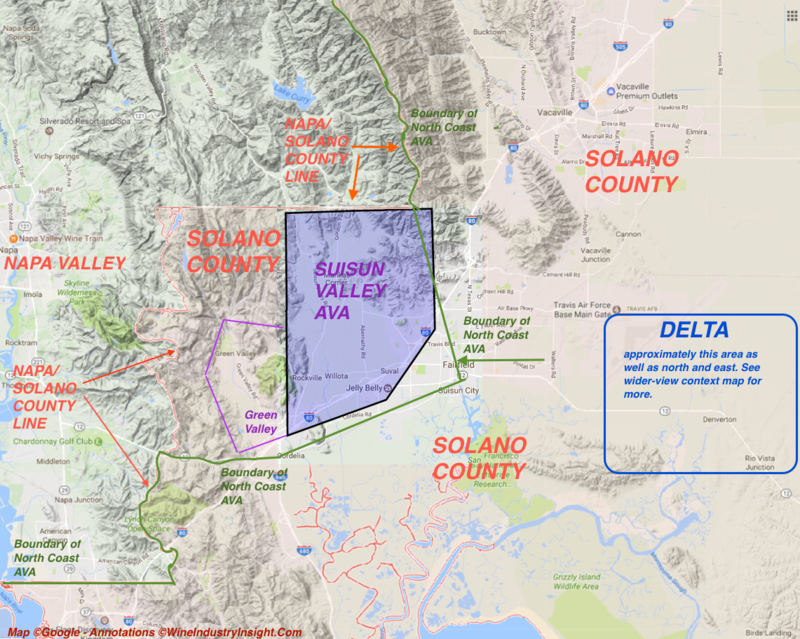 Of that, Suisun Valley probably has about 2,000 acres bearing and Green Valley has a little over 500 acres bearing. 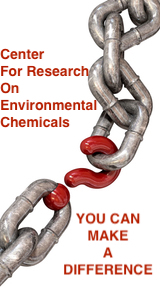 Those numbers, say experts, could triple given estimates on potentially plantable land. Suisun Valley has a semi-coastal Mediterranean climate with a cool wet season from November to April, followed by a warm dry season. Moist winds blow inland from San Pablo Bay and Suisun Bay at the headwaters of San Francisco Bay almost continuously from May through October, which minimizes frost danger. Mean rainfall averages about 20 inches (508 mm) a year in the southeast part of the valley to 30 inches (762 mm) in the northwest, with nearly all rain falling during the wet season. The climate is classified as mid-region III under the University of California, Davis system of heat summation by degree days, averaging about 3,350 degree days per year, with the mid-valley averaging 3,250 to 3,450 degree days per year, and the upper valley averaging 3,700 to 3,750 degree days. Sedimentary rock composed of sandstone and shale of the Great Valley Sequence that is Early Cretaceous in age makes up the bedrock that is buried beneath the fill of the valley floor. Similar sedimentary rocks crop out in the hills that border the east and north sides of the valley. By contrast, rocks of the Pliocene-age Sonoma Volcanics, which are mainly pyroclastic breccias and tuffs, with some interbedded volcanic flows, make up the Howell mountains that border the west side of the valley. An alluvial fan formed by Suisun Creek and Green Valley Creek drains the northern uplands and covers most of the valley floor, with the fan building out to the south into the Suisun Marsh. While no directly parallel data could be found, this article — Sacramento–San Joaquin River Delta — notes that most Delta farming is on land which has been reclaimed through the use of pumps and levees. As a result, the soil is moist and consists of peat and highly fertile sediment which has washed down from an extensive watershed that drains about 50% of all California runoff. In addition, because Delta vineyards are basically flat, they receive continuous sunshine throughout daylight hours. As a result, vineyards in the Delta are extremely fertile. A cost study by the University of California, Davis estimates that yields are easily 7 tons per acre or higher. Vineyard experts familiar with the area told Wine Industry Insight that there are about 1,000-1,500 acres of winegrapes planted in the Delta area of Solano County. But their higher productivity means that the Delta produces 2/3 of the total district/county tons with about 1/3 of the bearing acreage in the district/county. Because of the varied terrain and orientation of vineyards in Suisun and Green Valleys, no overall acre tonnage estimates have been teased out of the overall crush district data. However, their less fertile soil, varied sunlight and irrigation costs restrict production to a fraction — perhaps 1/3 — of the Delta’s. It’s worth noting that all of the Suisun and Green Valley irrigation water comes from a single canal supplied from Lake Berryessa. Water rights for the canal come from the Putah Creek watershed which was inundated by the construction of the Monticello Dam that created Napa County’s largest water source. According to AGG’s Bitter, the current need to distinguish between the two Solano County grape growing regions lies in the Clare Berryhill Grape Crush Report Act of 1976 which created the mandate to report purchase prices and tonnages crushed by district. Unlike federal AVAs which are required to be defined by unique topology and climate data, the Grape Crush Report Act was simply a method to group counties into crush districts for reporting purposes. No attempt was made to distinguish the districts on the same basis as AVAs. However, because the prices paid for various grapes are reported district wide, that results in Suisun/Green Valley grape prices being overwhelmed by Delta fruit. Solano County detail below from the California Crush District map.